Boston startup Ubervu is a new social media dashboard startup. Sure there are a lot of startups in the space however what sets Ubervu apart is their intelligence layer. 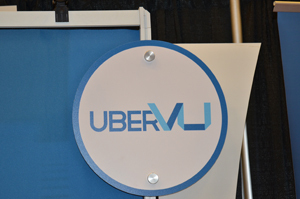 Ubervu finds what people are saying about companies across the social web. They take that information and convert it into easy to understand usable data to get companies engaged with their customers. uberVU is a software-as-a-service that delivers a simple, intuitive interface that decodes large data sets, allowing marketers to act strategically and to complete daily social media tasks more easily. uberVU enables these marketers to increase social media results by making the right responses and sharing the right content, at the right time, in order to grow and engage the right audience. People talk about companies and products online every day. We monitor and analyze those public conversations. We then use smart methodologies to come up with ways for brands to send more relevant messages to more relevant and influential people, at the most relevant time. The founders are Dan Ciotu, Vladimir Oane and Dragos Ilinca. They met in Bucharest, Romania, while studying computer science, and this is their second business together. While they’re all technical, their specific interests and skills diverged into product management and design (Vladimir), sales (Dan) and marketing (Dragos). uberVU is based in Cambridge, MA and Bucharest (Romania). The Cambridge/Boston scene is very vibrant, with a strong focus on technology innovation for B2B and Enterprise markets. You can find people working on gene sequencing technology, robotics, biotech or advertising and marketing automation software. Consumer-focused startups seem to be the exception. How did you come up with the idea for uberVU? We owned a web marketing shop in Bucharest that we started while in college. While working there, we helped brands run social media properties and campaigns, which were mostly blogs at the time. We could not find a tool to help us grow and measure our customers’ social media initiatives. So we started building one. The initial prototype and value proposition were quite different, but they evolved with the market. The uberVU product you see now is probably the 15th iteration. We came up with several names, and we liked uberVU most. uberVU (read uber-view) refers to having the ultimate overview over a brand’s social media world. It expressed our vision for the company, without being too narrow or restrictive. What problem does uberVU solve? uberVU solves a very difficult problem that most socially-active brands have. They have invested a lot of time and effort to build their social audiences. But without keeping them engaged, and constantly finding new relevant audiences and channels, their money is wasted. So we’re giving brands tools to measure and understand what is working with their audience to then find and reach similar audiences beyond what they have today. On top of what we feel is the best social media marketing solution we have built an extension named uberVU Signals. Signals is an artificial intelligence technology that detects actionable content, events or insights from the social media noise. It works by scanning everything that’s happening around a brand in social media (third party mentions, competitor mentions, their own Facebook & Twitter accounts) and looking for things that might be important to act on. These include influencer mentions, trending stories or content they need to know about, spikes in activity or sentiment. We won Seedcamp in 2008 and then raised a VC round from Eden Ventures in the UK. We do an assortment of activities that can be boiled down to creating unique views on the industry that we then distribute to our social channels through our platform. We eat our own dog food at uberVU and use our product to help us engage and grow our social audiences.. There were many. Some of the most important were being able to evolve at the market pace, not slower or faster and being able to keep a world-class team level as we were growing the team. Elon Musk, because he takes the term “technology entrepreneur” to a whole new level. He keeps amazing me over and over again, which very few people have managed to do. Some exciting things are in the pipeline for us. Our market is constantly evolving, and I believe some major shifts are going to happen in 2013. We’re ready for those shifts both on the product and business sides. All I can say is that it’s going to be a very interesting year for us. www.ubervu.com and blog.ubervu.com are the best places to start learning more about us and the social marketing space.